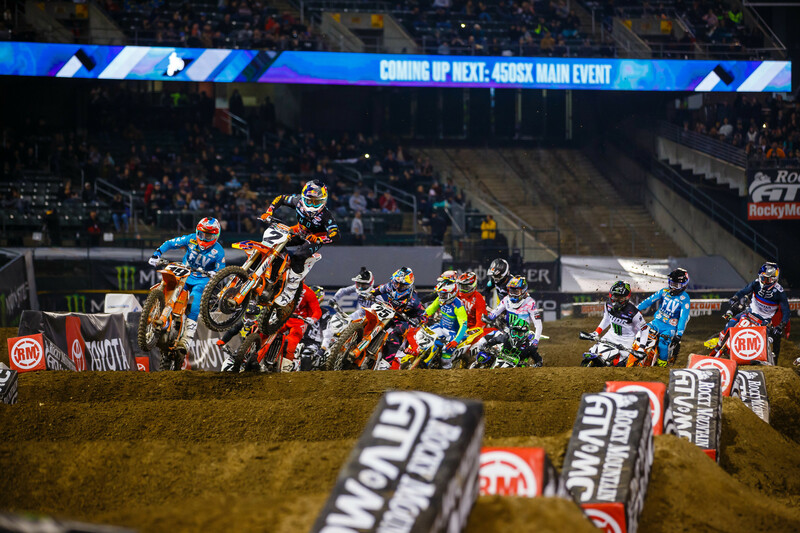 Round four of the Monster Energy AMA Supercross was up in Oaktown and the beautiful Oakland-Alameda Coliseum. I kid, but there were a lot of people there and once again, I can’t believe what a dump the place is. The Raiders and A’s play there and both are doing everything and anything to get the hell out of there. Raiders are going to Vegas in two years, A’s are trying to go south and the Golden State Warriors are in their last year in the arena next door before they go to San Fran. Last sports team out of Oakland, turn off the lights. The track in Oakland was pretty good, little sketchy of a first turn but pretty tough overall, which is fine. Two sections of whoops are awesome and making the finish line the size of a regular triple is a nice touch. Some big rhythms out there also and a sand section that actually kind of worked even though dumping sand in a turn usually doesn’t. Last year the track crew added nets to the outer berms of the stadium floor, which enabled them to build bowl turns, with the net ready to catch a rider if he went nuts and flew off. As most of you know, I’ve been ranting about nets for years because bowl berms make racing better, and nets stop the possibility of a bike going into the stands. No longer did riders have to slam on the brakes and follow each other through the inside rut in a bermless turn. We were much happier last year. Blake Baggett was probably saved from a serious injury when he flew into one at Tampa. Going into 2019, I would have thought that we’d see more nets because they worked so well. But nope, still just the one that can be used in two turns if needed. We had Justin Hill fly off a berm at the end of the first whoop section on the interior of the track. A net would’ve been great there and not sure why they’re not there. My first idea for a net was to improve the racing and that’s worked. A side benefit was rider safety and really, how much could a net cost? WE NEED MORE NETS!! Well, well, well. He did it again. 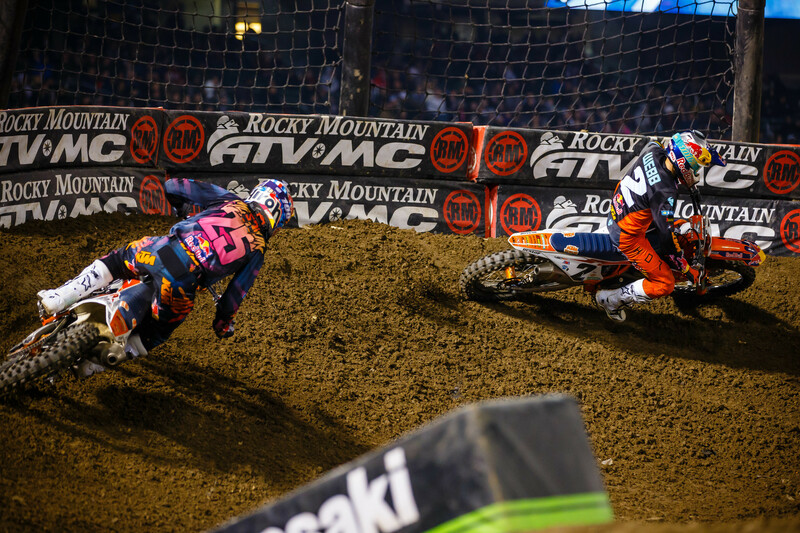 KTM’s Cooper Webb led all the laps in Oakland to win his second race in a row and second of his career. And he took the red plate. I mean, wow. How cool is this? I just go back to his interview on the PulpMX Show last Monday night and how honest he was about the last two years at Yamaha and his decision to go to KTM and move to Florida to work with the Aldon Baker crew. We got great insight into a guy that wants to get his career back on track. He’s got the resume, we’ve seen that, and now he’s working harder than before, the bike suits him better, and we’re all seeing it pay off. I was perhaps most impressed with Webb on the last lap when his teammate Marvin Musquin was all over him and looking to make the pass for the win. Webb absolutely slayed the two whoop sections even though he was probably feeling both the fatigue and pressure (everyone I spoke to remarked how tough the track was and how tired they got). Late in the race he dug down and pulled away from Marv to win. Sooooo, like, where’s this going? I DON’T KNOW BUT IT’S AWESOME! I mean, we know Webb can win titles, we know he’s talented and the bike/team are great. Why can’t he win this thing and take perhaps the most unexpected 450SX title since that Jeremy guy in ’93? By the way, for those that are counting, this is yet another notch on Aldon Baker’s belt. 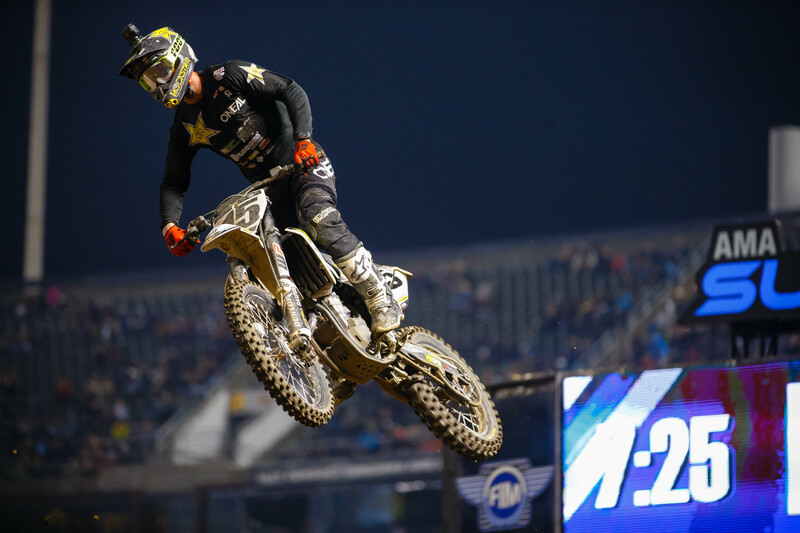 I know you Baker haters loved the Broc Tickle suspension last year, which hopefully we hear a ruling on soon, but you had to put up with a Jason Anderson supercross title also. Now Aldon has taken a down on his luck, talented kid and helped him win two races in a row that NO ONE thought he would. Especially not this early. Yup, the Baker program isn’t for everyone for sure but guess what? It just happens to magically work for a lot of people. Baker’s too modest to go around touting this but yeah…scoreboard people. 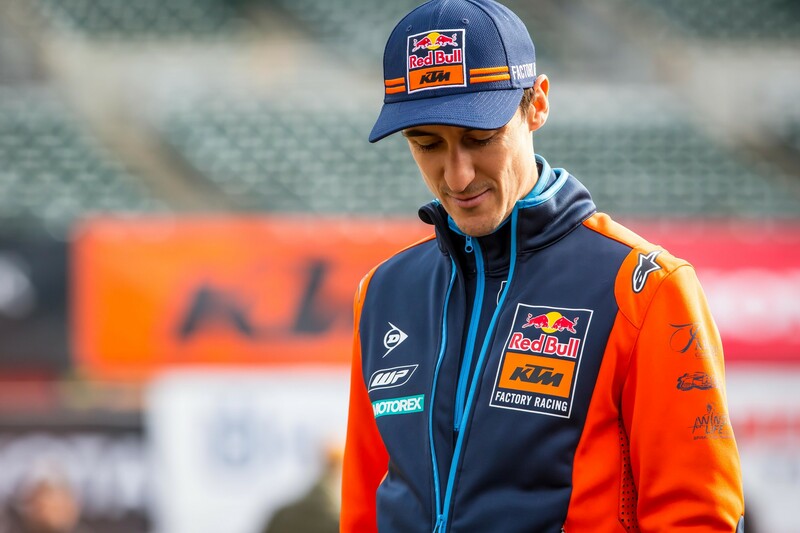 I know I just spent a bunch of words talking about Webb’s win but Marvin Musquin, without his fall, would’ve won Oakland. Marv’s started the season slow due to a knee injury but he was very good last week and excellent in Oakland. I mean, he crashed and got passed by Ken Roczen and Eli Tomac only to, wait for it, regroup and pass both those guys back! Marv was on fire and closed on Webb at the end. We’re not talking a lot about the Frenchman right now with so many other interesting things but he’s heating up. Also the whoops got gnarly and beat up and just like last week, he passed dudes by jumping through them. I know we harp on Marvin for his whoop skills (David Vuillemin was basically brought in to help him with those) but he can make jumping through them work very well. I know I just spent a lot of words talking about Cooper Webb and Marvin Musquin, but Blake Baggett was amazing in Oakland. Started in 11th and ripped up to third, there were many laps where Baggett was the fastest rider on the track. He blew by some big names on his way to the front. This was Glendale El Chupacabra and not A2 El Chupacabra! His charge ended with a few laps to go, I’m sure he hit the wall with all the work he had put into getting to third. Team manager Michael Byrne told me that Blake’s been bothered by a back injury and hasn’t been able to ride much or at all during the week. So this makes it all the more impressive. I was talking to one of his competitors and he was telling me that in amateurs Baggett was just like he is now where he’ll be amazing one week and then invisible the next. Well this week the good El Chupacabra showed up and it was a hell of a ride. Also, I would like to award the Rocky Mountain ATV/MC-WPS-KTM team with the “longest post-race meeting in the history of the sport” trophy. They surpassed the Honda guys from a few years ago. I must not really want it, because I bailed on a BB4 interview. They might still be there talking, someone go check the parking lot. “I just imagine as a fan how frustrating it must be to watch me. I get it. I’m a smart guy. I understand,” Adam Cianciarulo told me after his second win of the season. This comment made me laugh because AC is as self aware as any racer in the pits, clearly. AC rode a great race to take a win that I have to admit, I wasn’t sure he would get. Colt Nichols was ALL OVER him early in the race and in my opinion, Colt wasn’t going to get by without Adam crashing. That’s just the way Adam is wired I think. He’ll just try to go even faster, and maybe he pulls it out, or maybe he crashes, but either way the desire to win overcomes the desire to let anyone have the lead. However, knowing this only makes last year’s San Diego supercross even weirder. That’s when Hill ran Adam down and took the win. Yeah, that’s still weird. Anyways, AC regrouped, changed his lines in a bunch of sections and held it steady for the W. Cianciarulo has two wins and two races where you went WTF. We’re due for a WTF this weekend, let’s hope he stops that streak. As for Nichols, he told me after the race that he knew this was Adam and there’s a chance (for the reasons I laid out above) that AC pulls an AC and Colt would get the lead. Nichols still holds the red plate but things are getting tighter and tighter. He’s been very impressive this year and I’m on-board with him as a legit title threat as I laid out last week. Chad Reed has moved to North Carolina and is loving it. Except he can’t ride until after noon when it warms up a bit. He told me he made these little neoprene finger sleeves for riding that seem to work. 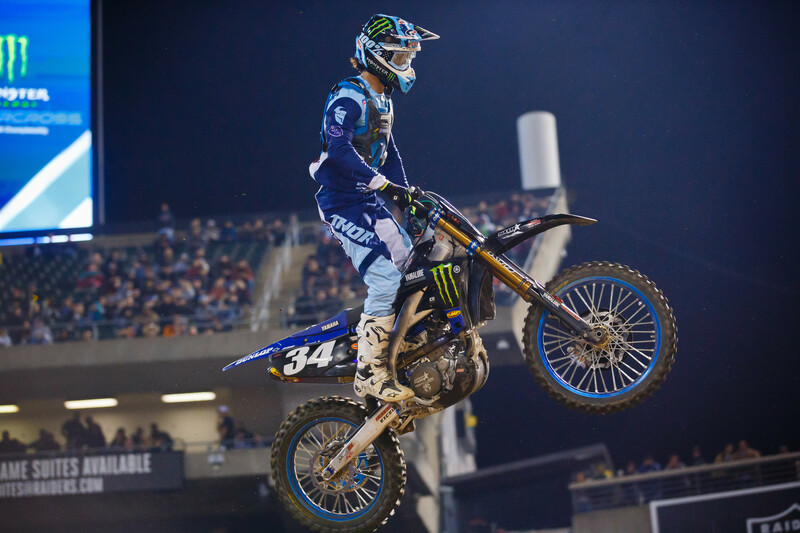 #NCProblems…Reed had a decent race, nothing to write home about but the whoops breaking down didn’t help him out there. Jimmy Decotis had a poop main event but he looked great in practice and won the heat race. He should hang his hat on that and not worry about the early crash that ruined his main event. He also told me he was sick all week and didn’t ride, to which I replied, “You’ll probably kill it then,” which he did. Positive weekend for Jimmy D.
I’m not sure what Justin Hill is doing to start the year but it hasn’t been good outside of a few great practices. He looked very tired in Oakland and sort of just cruised around. You’d like to see more fight out of your highly paid rider if you’re JGR and Suzuki. But having said all this, there will be a race here soon where he’s “feeling it” and the “process will be trusted” and he’ll shred. You just have to hope that it’s soon if you’re Coy Gibbs. I spoke with Mitch Payton for a bit in the morning and told him that Adam Cianciarulo’s races have been very exciting to start the year. He told me yes, they have been but that he wants “boring, not exciting.” We spoke about Garret Marchbanks also and Payton expressed that he’d like to see the rookie be a bit more aggressive out there in the early laps. It sounded like Payton’s been a bit more than “asking” Marchbanks to change. What a cool story Dean Wilson’s deal is turning out to be. 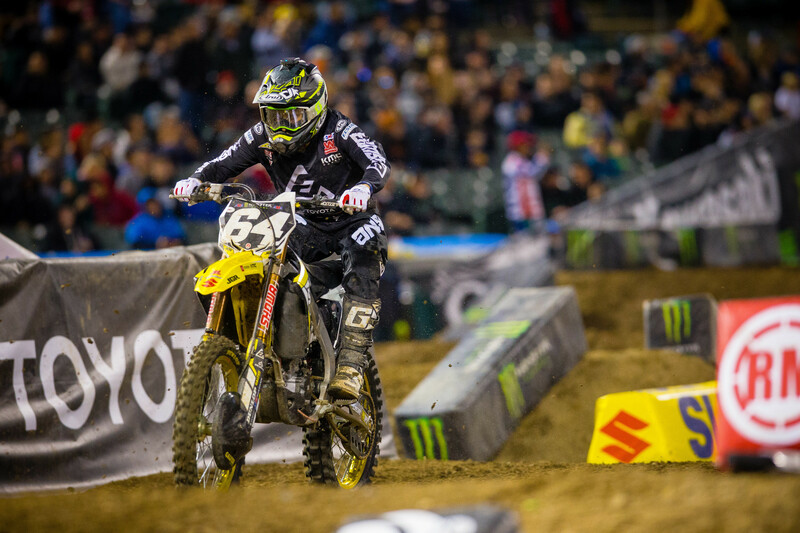 Sixth in the main, after a win in the LCQ, Wilson’s been a nice story in a season of nice stories. I think he’ll be in the Rockstar Energy Husqvarna truck on Jason Anderson’s bike real soon, although he was waffling on that idea after the race. I mean, I get that you’re burning the sponsors that have helped you now, but they’d understand it I’m sure. Is Andy Wilson (Dean’s dad) driving the sprinter all over the USA the better deal? Zactly. Wilson met up with Oakland Raiders star running back Marshawn Lynch on Friday night at his restaurant. Apparently, Marshawn is a fan of dirt bikes, has a 450, a Monster Truck, and wanted Dean to send him some Rockstar to drink. Sounds like the start of a beautiful friendship. Speaking of the LCQ, I wrote this last week about Justin Bogle: “It’s not going to come easy, but you know how I think Justin knows all of this? He’s not pulling starts yet. When he is, you know he feels better.” Well, he must be feeling a bit better because he ripped the start from the outside gate and almost got the holeshot. Bogle’s starting to get used to the KTM everyone. I was talking to the Kawasaki guys before the day got started and they said they’ve been very happy with Joey Savatgy through three races, despite not getting much results-wise yet. The speed is there they tell me and it’ll come out soon enough. In Oakland, it did. Savatgy won his first career 450SX heat race and was running a strong second in the main when his KX450 ground to a halt. A factory 450 breaking in a SX is rare and this sucked for Kawasaki and Joey. We’ll probably never hear what happened and the “electrical” term will get thrown out. Either way, Joe Dog’s got to be stoked with his night and understand that the DNF doesn’t really matter, he had already missed a race with an injury, so points don’t really matter anyway. 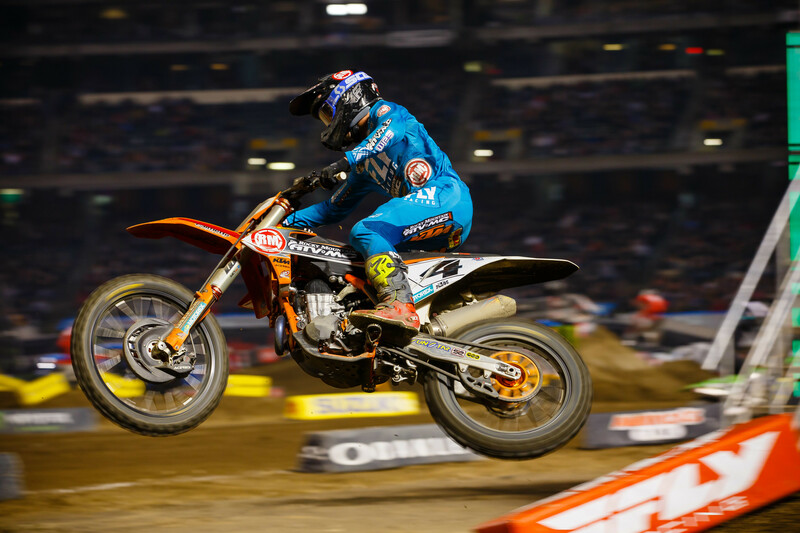 This was a very good night for Savatgy and I bet he can’t wait for San Diego this weekend to keep it going. I was walking the track talking to AC and Nick Wey when Justin Barcia walked by. I’m not sure who started it, it was probably me telling him I can help him out on the track if he wants, but he asked me if I had ever raced before. This made Wey laugh pretty good and it was now time for me to jump in and tell him about the four Manitoba titles, Canadian national results, Millville, and the 500’s with Jeff Stanton and all the stories I’ve told others before. When I was finally done I asked Barcia if he had a little more respect for me and he said, “Maybe a little,” and walked away. Thanks for reading OBS this week, good times indeed. We’re onto San Diego and hopefully the weather holds up. Email me at [email protected] if you want to chat about this or anything else.